Inflexible, inhuman and robotic, Iván Fischer races through Mozart's glorious Symphony 39 at break-neck speed. 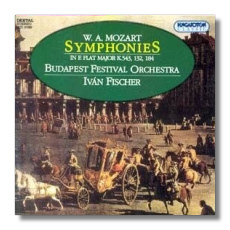 Fischer's performance of Symphony 19 fares considerably better, but his Symphony 26 is stiff and uninvolved. In either case, this release represents no competition for the effervescent Neville Marriner. The Budapest Festival Orchestra plays exquisitely. Unfortunately, their efforts are sabotaged at nearly every turn by an unimaginative conductor and Hungaroton's dry, clinical, in-your-face recorded sound. To make matters worse, each track (save numbers 1 and 10) starts nearly a full second after the music begins. Mozart doesn't deserve this - and neither do you. Copyright © 1995, Thomas Godell.